Together we make up the 'honey girls'. We have a kit club together called 'Honey I shrunk the kit' You can see our logo below. I am not a vintage girl as you will see but I am starting off with my attempt at 2 vintage cards then as we go along you will see the inner CAS Sandie slowly emerge using the same set of goodies! I have to admit this card was inspired by this card I loved on pinterest and is very similar to it but with my take on vintage added. The sentiment is so old I can't remember where it is from. I was worried about adding all these sequins and thought it would take forever but Nonni gave me a special pencil she got when she went to Japan and using this with sequins makes it so easy. But I think you might need to travel to Japan to get one! Gosh this card took me hours to make. I had an idea in my head but every time I tried it out...in the bin it ended. I played around for ages trying out different things. 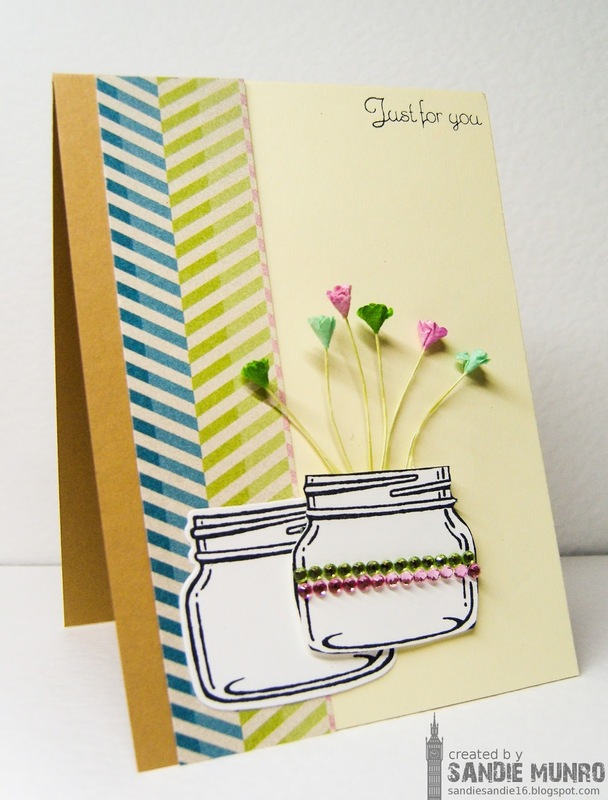 I really wanted to use these die cut jars that were in the pack plus this chevron DSP. Well in the end this is the card I made. I found these little flowers in my stash and coloured the petals to match the paper. I then found some gems to add to the jars...I now realise they are not straight but too late! Although not my normal card I actually think it is quite sweet and am sure I will use it at some point....thanks for pushing me here Hazel! Finally the inner Sandie emerges and CAS is here again!! 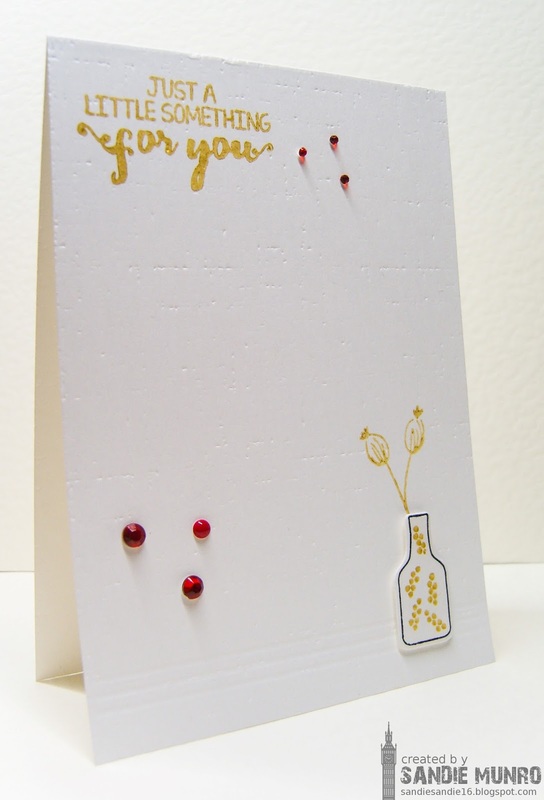 I used this sweet little vase die cut from the pack adding my own little vintage gold pattern. Score lines ground the die holding stamped gold flowers. I added the sentiment on the leaft top to balance my card. All the gold is stamped with delicata ink so looks embossed IRL. This was such a fun kit to play with. So a huge thank you to Hazel for this. Here is a photo and product list of the kit. Sandie, you did an AMAZING job with this kit!! I LOVE all of your cards! I only see creative brilliance here - no struggle!! However, I certainly did struggle, and it was my own kit! Oh well! It was worth the stretch, my dear! You rocked it home!! :-) Thanks so much!! Wow...so many sweet cards, love those canning jars. 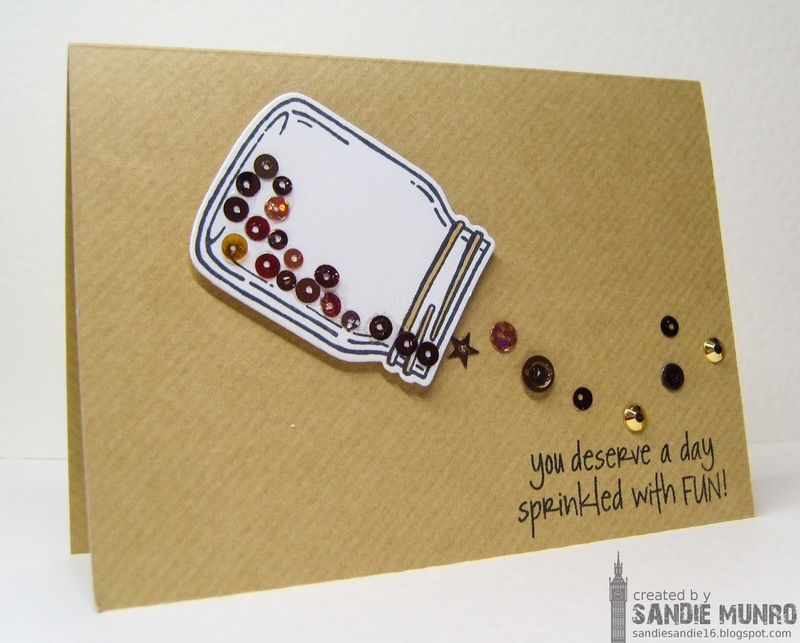 Wow Sandie, you did such a fantastic job with your kit. I absolutely love your CAS designs and especially love your flowers in the jar. Just brilliant!! A real treat ths post with so many inspirational cards! So good to see that the same kit leads to so different cards... 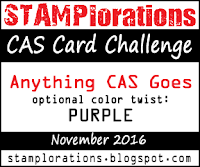 Think the purple with cupscard is my favorite; the purple looks so vibrant! Enjpy the rest of your sunday! 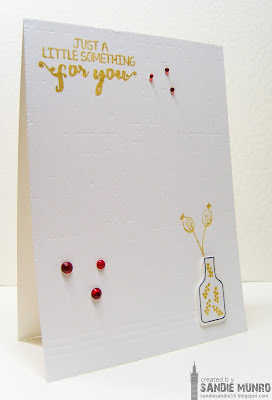 You did great working with materials you are not so familiar with, I see no struggle here and many cards have a lovely vintage feel! Hard to choose a favorite... Maybe it's the first one. I love the brown card base and the sentiment is brilliant! 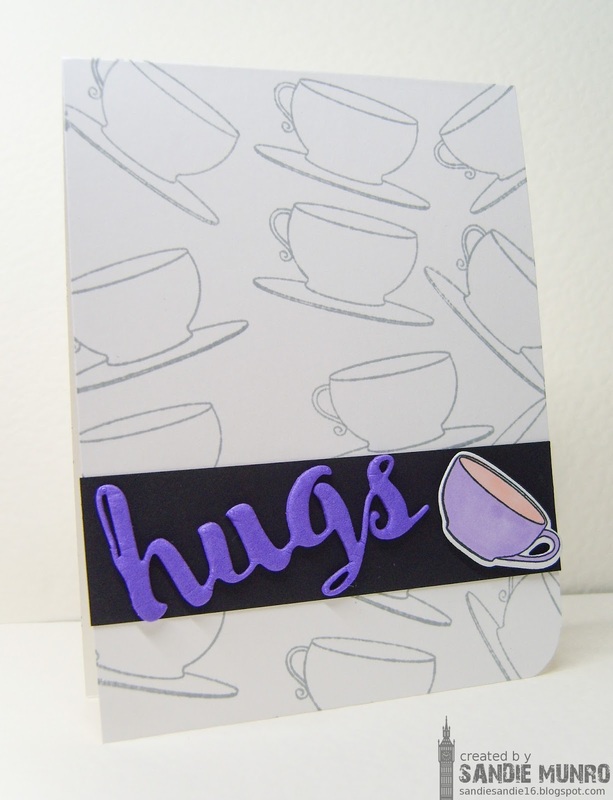 Hi Sandie - I love your tea cup card - love the background you created! Thanks for playing with us at STAMPlorations! Beautiful card! Thank you so much from Sovushka Slavia's blog!